Andrea Joy Campbell greeted well-wishers Tuesday night. 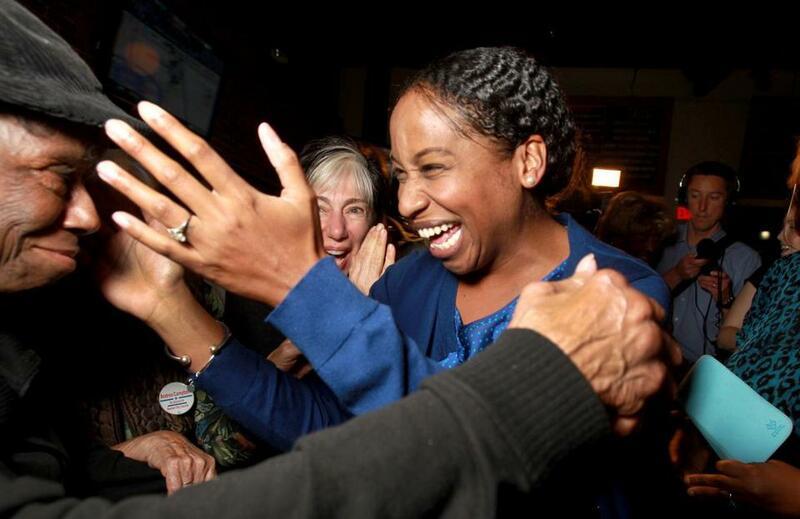 Boston voters on Tuesday picked a pair of women to join the City Council, unseating two long-serving men and bringing the total number of women on the council to four, which ties the record. Four women councilors will serve on the 13-member panel for at least the next two years — returning councilors Ayanna Pressley and Michelle Wu, and newcomers Annissa Essaibi George and Andrea Joy Campbell. The only other period when four women served on the council was from 1994 through 1997, when Diane J. Modica, Maura A. Hennigan, Maureen E. Feeney, and Peggy Davis-Mullen all had terms that overlapped, according to a Globe analysis of city records. The first woman to serve on the council was Mildred M. Harris in 1937. Since then, 10 other women have held a seat on the council. Essaibi George and Campbell will be the 12th and 13th councilwomen when they are officially sworn in next year. The high school teacher beat Stephen J. Murphy to capture the fourth at-large seat representing the entire city. There has been at least one woman on the council for the past 41 years, since 1974. The longest-serving councilwoman was Hennigan, who held a seat for 24 years, from 1982 through 2005. When the council was first formed in 1822, there were two branches: a board of aldermen and a common council. It remained in that form through 1909 when the two-branch system was dropped for a nine-member at-large council. In 1983, the council was restructured again, expanding to become a 13-member body consisting of four at-large seats and nine district seats. The first year a woman served on the council was 1937. Louise Day Hicks 1970-1971*, 1974-1977, 1979** *resigned January 25, 1971. **resigned January 3, 1979.